Palestinian Authority Chairman Mahmoud Abbas says US President Trump 'provoked millions of Muslims' by recognizing Jerusalem, threatens war. Palestinian Authority Chairman Mahmoud Abbas threatened war if US President Donald Trump does not allocate Jerusalem as the capital of a future Palestinian State. In a Cairo speech, Abbas said, "Jerusalem is the key to peace if it is our capital, and if it is not - it is the key to war. Trump will need to chose." According to Abbas, Trump provoked millions of Muslims by choosing to recognize Jerusalem as Israel's capital. "There is no such thing as a Palestinian who will give up even one millimeter of Jerusalem," he claimed. 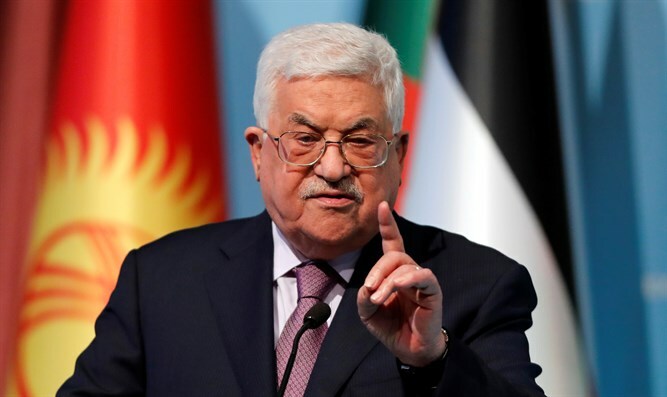 Last week, Abbas told the Palestine Liberation Organization's Central Committee that the international community "wanted to bring the Jews here from Europe, in order to preserve European interests in the area. They asked Holland, who had the largest fleet in the world, to transfer the Jews." "Israel is a colonialist project that has no connection to Jews." Cursing Trump's threat to cut funding to the Palestinian Authority, Abbas said, "I saw his tweet saying that the US won't give Palestinians money because 'we refuse to negotiate.' May your home be destroyed. Where did you offer that to me? On the phone? On television?"